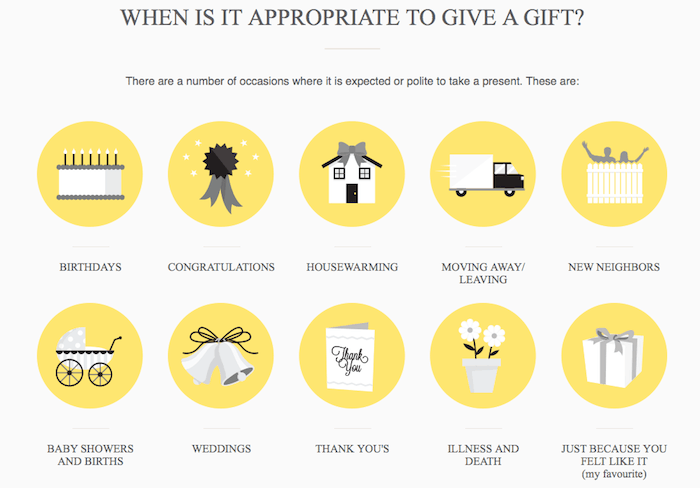 Think You Know Everything About Gift Giving? You're Probably Wrong. If you’ve been handing out Daiso mugs during birthdays and anniversaries, listen up: nobody likes receiving them. It’s never easy hunting for the perfect gift, especially if you’re buying for friends whom you’ve known for years. Nowadays, photo frames and coffee mugs are widely considered to be generic gifts. Buy them and you’ll probably get an exasperated sigh in return. Does an upcoming birthday set you in a mode of despair? Well, here’s a piece of good news: you don’t have to worry about that anymore. Caroline Stanbury, a socialite and founder of Gift Library, has compiled a “fail-safe formula to help you budget for and choose the perfect presents for any occasion.” Here’s what I’ve found out. I have to say, I’m guilty of #2 and #3. Everyone has his/her own preference. What works for you, may not for your friend. At the end of the day, there’s no accounting for taste and that’s the way things are. I couldn’t agree more with #5. What Modern Family’s Manny Delgado said about letter writing is on point: “It’s a lost art. No one puts pen to paper anymore.” That said, don’t underestimate the power of a handwritten card — it goes a long way. It’s really interesting how single people are more accepting of humourous gifts than those in a relationship. Does that mean we lose our funny bone when we become attached? It’s definitely something worth thinking about. 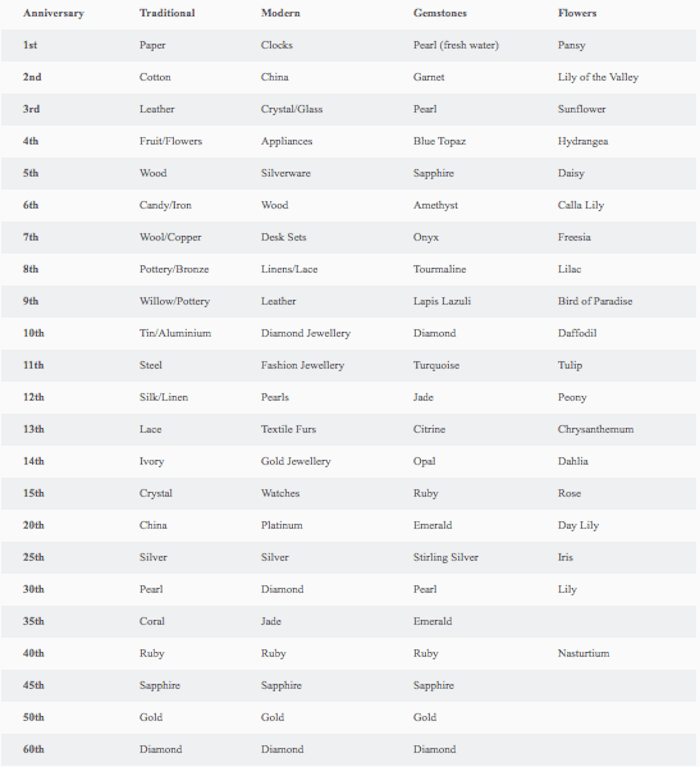 Here’s another quick guide to shopping for your spouse on your wedding anniversary. Note that not all the gift ideas in this guide will work in an Asian context. For instance, it’s never a good idea to buy chrysanthemums and clocks for your Chinese friends. The phrase ‘to send clock’ in Mandarin sounds similar to the word for ‘funeral ritual’, and it’s never cool to associate gifts with death — it’s common courtesy.